It will not surprise any intelligent reader to learn that, in Our estimation, the present chaotic economic and resultant social conditions will not last for very much longer. Nor do We see a sudden transformation and return to the mythical ‘status quo’. The peoples of the world, in millions, have begun to sense the aroma of freedom, and for little longer will be denied its boon. Across the world, most especially among the young, the potent desire for change is being given expression. The young want a new kind of world, a new structure which includes them and their aspirations. These aspirations are for justice and sharing, for meaningful work and an opportunity to raise their families in sufficiency and peace. For too long have they languished in poverty and obscurity, denied a say in their life’s endeavour. From now on the governments of the world will have to consider seriously these aspirations of the hitherto silent majority, and change their plans accordingly. The ‘landed rich’ will find it difficult to maintain the dramatic gap between their way of life and that of the average ‘peasant’, as the cry for equality forces change. It will be understood that the present divisions in financial power are central to the instability of world finance. The old order is collapsing and no government can halt this process. The new energies of Aquarius are waxing stronger, breaking asunder the old corrupt and decadent order. The young, and young at heart, are the first to register the appearance of this new aspiration for justice. The desire for right relationship wells up strongly in the hearts of the young. Meanwhile Maitreya continues His progress among the nations, speaking freely of the need for justice, sharing and love. These ideas are finding many followers as the tension of today’s conditions makes its impact throughout the world. In the USA and Mexico, in Brazil and now in Russia, Maitreya places before His audiences the alternatives facing humanity: to continue on the present senseless and greedy path to oblivion or to see the world as one, on a journey to perfection, as brothers and sisters; to see that only sharing and justice will give us the peace we all desire and a world that prospers according to the Plan, and so find our way back to the Truth and Beauty we once knew and fostered. 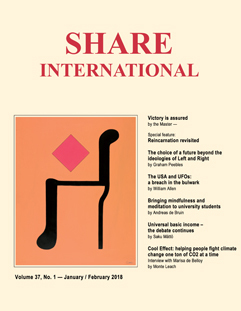 On 15 November 2003, nine people were in the Information Centre in Amsterdam working on the December 2003 issue of Share International. A visitor entered – a tall, slim, elegant, smartly-dressed gentleman of about 70…. He looked as if he was about to laugh, although he spoke seriously and with great authority. He came in to exchange a book – he’d bought one three weeks before, and now wanted to buy another instead.… By bringing the book back he alerted us to the fact that he was the same man who had visited the Information Centre and spoken to two colleagues; he had been confirmed to be a familiar of Maitreya. He started by asking about Transmission Meditation groups …. Visitor: What other activities are you involved in? We said that we take part in fairs. Yes, fairs are very useful work. But lectures are more important…. Because those who go to fairs may or may not be interested – it’s random. People see the stand, see the information; they may take a folder and read it later. So fairs are extremely useful. With lectures it’s a self-selecting public. Our public is small – those who are directly interested will come to a lecture and they’re already open to our information. So when there’s a lecture they come to hear and to learn. Only reading is not so important. Some people just read a lot. Just do the work – just do it…. We live in the world. And since we live in the world we have to inform people. How do we do that? Well, we must communicate with them – give lectures, talk to them. But man must walk on two legs, so both activities – informing the public and transmitting the energies – are important. Both are necessary. Now, there are people in these groups who are always asking: “When is He going to come?” “How long must we still wait?” “Why is it taking so long?” …. But why ask all these questions? One cannot really say that He’s coming, because He is here. He’s already here. Don’t they know it? Don’t they see Him? It is about His Presence in the world – and that is happening. Perhaps it has taken longer than they had hoped. It has taken longer than I had hoped, and perhaps it is working out differently from the way we expected, differently even from what I had expected, but it is working out. He is here. I have no doubt whatsoever that it is working out. It will work out. It is working out. No shadow of a doubt, none whatever. Many people know He’s here, they know it inwardly, intuitively. And many people are open to hearing that Maitreya is here. Just be there. Be there, that’s all. Not everyone is going to be interested. People are involved in their own thoughts. The most important thing is just to be there; those who are ready will respond….It is not for you to hope. You don’t have to hope or want anything. Just do it. Just give the information if they ask. Look, we’re not going to convert people. We’re not here to proselytize. We’re not missionaries. We tell them if they ask. The most important thing is that in essence it’s all here. If you’re open to it, you just know it, you don’t need to think about it. You don’t even need to talk about it if you’re open to it. You know that in essence it is all here…. Yes, the result shouldn’t concern you. Just do it – don’t want results. Don’t look for results. It’s a Western attitude, a habit of mind, that we always think we have to make something happen. We think we have to do things, make things happen. But it’s not necessary. All change happens slowly. Very gradually. Just think of how many times, how many lives – you know what it’s like yourselves – how many times we fall and stand up again, fall and try again, we fall and stand up again. Life after life. Change takes time. [In response to concerns about the state of our planet:] You may worry as much as you wish but it will not change anything. Worrying will not help, but everything will still work out. What is true is that we will face difficult times. We will go to the edge of the abyss, but we will not fall in. We will skirt it, but we will not fall over the edge. Everything will work out. All will be well. There is nothing to fear. I have no doubt at all! No doubt whatsoever. I have no more authority than anyone else. But it is my belief! I know it. (At this point we understood him to mean that his belief is born of conviction coming from knowing. He seemed to mean the difference between simple unfounded hope and his belief or conviction based on knowing.) People talk about hope but if you believe it, hope isn’t necessary. Don’t forget how powerful Maitreya is. People forget how powerful Maitreya is! He bowed to us all and said: I thank you heartily, with his hand on his heart. We had known that he was Maitreya (or a familiar) and he knew that we knew….We all behaved as if this was quite normal or ordinary but at the same time there was a heightened atmosphere, a hush of incredulity.… He left us in no doubt that “He is here!” and that “All will be well”. Were we correct in thinking that the visitor was Maitreya? Magazine teams, Information Centre, Amsterdam. *We were fortunate to have been helped by a Master to find new and larger premises for the Information Centre; our public programme now includes two or three public activities [lectures and Transmission Meditation Workshops] each month. We are open six days a week. On 14 February 2018, 17 people were killed and 14 seriously wounded by a lone teenage gunman at a high school in Parkland, Florida. It was one of the deadliest school mass shootings ever. According to a New York Times report* in 2015, ‘mass shootings’ (leaving four or more victims wounded or dead) now occur on average in the US at the rate of one per day, in public and domestic incidents. With less than five per cent of the world’s population, the US has had one-third of the world’s documented mass shootings since 1966. The Philippines, Russia, Yemen and France collectively had the bulk of the rest. With an average of 90 firearms for every 100 people, the US has the highest percentage of gun ownership in the world. There are roughly 310 million civilian firearms in the US – an estimated 1.5 million are military-style assault weapons like the one used in the shooting at the Parkland high school, and in December 2012 at the Sandy Hook Elementary School in Newtown, Connecticut. At the same time the USA is the only Western developed country to still uphold the death penalty, and 23 people were killed by US states in 2017. The shooting in Florida reignited yet again the emotional and divisive debate over what to do about the disturbing amount of gun violence, as well as the increasing number of ‘motiveless’ murders – especially committed by the young. The debate remains focused chiefly on the availability and easy access to firearms of all types. While that is an important component of the problem, underlying factors such as the breakdown of social cohesion, the psychological poison of competition and stress, and the increasing potency of new energies entering the world, remain unknown to politicians and pundits. We present below a brief series of quotations to remind readers of the some of the hidden conditions and forces behind many of these apparently senseless shootings, not only in the US but worldwide. Everyone, without exception, is responding to the new, powerful cosmic energies which are pouring into the world. This has a profound effect on everybody. If you have a slight mental or emotional unbalance, it does not take very much to upset that balance and cause this crazy outburst of violence with seemingly no cause. That is one of the reasons for this growth of unprovoked violence around the world. People are responding to powerful energies which they cannot control, cannot sustain, and to which they cannot adapt. Their unbalanced mental/emotional bodies are over-excited and they ‘flip’…. *The New York Times, 2 December 2015.
International migration is an integral part of a globalized world and yet the positive impact it has on global development is often overshadowed by misconceptions, factual inaccuracies and heated debates in the political and public forums. The International Organization for Migration (IOM) estimates that there are approximately 250 million migrants in the world today, the overwhelming majority of whom entered and remained in their host countries in a completely regular fashion. The public misconception that migrants have a negative impact on their host communities, both economic and social, is misplaced. The myth is that migrants choose to leave their homeland in order to settle somewhere better and, in doing so, they take jobs away from locals and create a burden on the social resources of their communities. Nothing can be further from the truth. According to the IOM, empirical evidence shows that migrants at all skill levels, including irregular migrants, impact their host countries by contributing around 85 per cent of their earnings into the economies and by paying more taxes than the costs of the services they receive in return. In addition, they continue to contribute to their home countries by sending roughly 15 per cent of the income back in the form of remittances, positively impacting the economies of those developing countries. The need for migration policies to be based on facts rather than fears is a priority and the positive substantial social, economic and cultural contributions migrants make to their societies must be highlighted and celebrated. Migrants risk their lives and the lives of their children and families to flee the only homeland they have known in order not to flourish, but to survive. They leave all they have behind – their customs, their language, their belongings, their friends and often their families – and give all they have left to the smugglers who promise to help them arrive safely in a new land. If they manage to survive the perilous journey to their new country they are placed in camps where living conditions are deplorable, overcrowded and unsafe. Greece has experienced a drastic rise in the number of migrants entering the country since 2016, with over 200 people entering daily, 40 per cent of whom are children. In February 2018, lawyers from the bar associations of several Aegean islands expressed their opposition to the compulsory detention of refugees and migrants reaching Greece from neighboring Turkey. Lance Bushie spent nearly two decades with the Canadian Armed Forces and almost three decades with the Peace River Fire Department in Alberta, Canada. In 2016 he organized and led a team of Canadian Rescue professionals on a seven-week deployment in Lesbos to assist a Greek NGO, Emergency Response Center International, in rescuing migrants arriving from Turkey. In 2017 the group deployed again and formed a dedicated organization, Canadian Marine Rescue Assistance International (CMRAI), who assists in providing a humanitarian response to the protection of the lives of immigrants by ensuring they arrive as safely as possible. CMRAI is one of 63 organizations in a group nomination for the Nobel Peace Prize for 2018. Shereen Abdel-Hadi Tayles interviewed Lance Bushie for Share International. SI: Can you describe how you scan for and identify migrant boats and what do you do when you find them? Lance Bushie: During the day, we did training and boat maintenance. At night, our boat was on patrol for migrant boats from midnight to sunrise. We can detect migrant boats in several ways: there is a shore-based team with binoculars and night vision equipment overlooking the water in the areas where the migrants typically arrive; the boat is equipped with infrared equipment as well as binoculars; radio/cell phone communications between shore, boat and Hellenic Coast Guard (HCG) – the national Coast Guard of Greece – keep us informed and, most importantly, detection is best accomp lished by sitting quietly with engines off and listening for people’s voices and/or the sound of an outboard engine. When we detect a migrant boat, the Coast Guard must give permission for us to approach and assist a craft that is not in distress or if there are people on shore in areas that are dangerous, such as with cliffs and large rocks. SI: What are some challenges to the search and rescue operations in Greece? LB: Gaining the trust of the HCG and the European Border and Coast Guard Agency, Frontex. They view most of the rescue Non-Governmental Organizations (NGO’s) as unprofessional and in duplication, therefore redundant. However, once the HCG and Frontex crews worked with us, their comfort levels rose and they would increasingly call our team on the radio and use us as a resource. We also had a working relationship with NATO warships that were working in the area and called us by call sign to share information. SI: What are conditions like for asylum seekers once they arrive in Greece? LB: The camps are overcrowded and there is no timeline on how long the asylum process will take. One of Greece’s refugee camps, Moria, had a fire and multiple protests during our time on the island in 2017. Once the HCG decides how the refugees come to shore, they are taken to port to what is referred to as Stage 2. This is an interim camp operated by the NGOs where the migrants are medically assessed, cleaned and clothed. They can spend up to 24 hours at Stage 2 until they are taken to Moria, where the government paperwork starts. UFO in the form of a lenticular cloud formation, Hawaii Island. Since the first sightings of so-called ‘flying saucers’ in modern times by Kenneth Arnold over Mt Rainier in Washington State in June 1947 and the reported crash of a ‘flying saucer’ near a ranch in Roswell, New Mexico, USA, the next month, many have been fascinated by the notion of visitors from space. The spate of claims from people around the world of meeting the occupants of flying saucers from the early 1950s intensified the public’s interest to the point where governments and the military felt compelled to begin a continual stream of misinformation and staged mysteries in order to induce fear of the visitors and confusion about their intentions. The original so-called contactees, meanwhile, invariably spoke and wrote about the visitors’ respect for our free will and concerns about our preoccupation with destructive weapons instead of efforts towards international co-operation. However, the following extracts show that on occasion the concerns of the space visitors have, like dandelion seeds, broken through the tarmac of vested interests in technicolour clarity. The first example would also be the least surprising, since it involves a film whose script was written by Desmond Leslie. His book Flying Saucers Have Landed included George Adamski’s first account of meeting a visitor from space in the California desert in November 1952 and he spent much time in Adamski’s company. In 1954 Leslie managed to raise sufficient interest for his script for Stranger From Venus to be made into a film. Despite featuring Patricia Neal, who also appeared in The Day the Earth Stood Still (1951) and later in Breakfast at Tiffany’s (1961), the low budget film was never going to be a box office hit, showing almost only people talking, in just three different settings. Released in the US as Immediate Disaster, the film tells the story of a stranger who arrives at a rural inn amid reports of the sighting of a flying saucer. The stranger eventually explains that he has arrived to deliver a message to the leaders of Earth from his superiors who are on their way from the planet Venus. When a meeting is finally arranged at the inn with top government representatives, the following exchange unfolds. Sometime in 2002, I was going to an appointment, and on the pavement I saw a young woman sitting cross-legged with a scarf around her head. She was holding a piece of cardboard that said that she would like some money so that she could eat. Her head was bent and I felt that she was ashamed to beg. I was touched by this young girl and thought about giving her some money when I returned – which I did. Her head was even more bent and there were a few coins in a glass that she held. I put a coin in it saying, “Good luck”. She raised her head and we looked at each other, her eyes shining, and I felt inundated with joy. This lasted all day. Who was this young lady? On 19 December 2001, I was ‘born again’. Something awoke in me on that day in my beauty parlour in Limoges. On 21 December a Miss Paiva came to visit me to have a facial. Already, our first telephone contact was different when she phoned to ask me for my prices…. After some negotiation Miss Paiva confirmed her appointment for that same evening at 6pm. On the phone she seemed to have an African voice. As I was waiting for her, I wondered how she would look. She was white, but her features looked foreign. We talked about this. I said that she was like a world citizen. She laughed. She said she found me different – that I wasn’t just a manicurist, but had more in me. We talked about her breadth of vision and adaptability. I told her that she didn’t seem to have any hang-ups. Most of my clients seem to have some. The session lasted two-and-a-half hours. She rang her parents who were concerned not to have seen her back sooner. My mother thinks that Maitreya showed himself through me to Miss Paiva. If this is the case I wonder what the purpose of the visit was? I’m grateful for any enlightenment. In the spring of 1975 I was at home (in my ground floor flat) giving my few months’ old baby a bath – when there was a ring on the door. I went to see who it was, with my baby wrapped up in a bath towel, and there stood a young man, who asked me for something to eat. A little surprised I asked him to come in and wait while I dressed my son whom I then passed to him (!) so that I could prepare him something to eat. We talked a bit (about religion) and then he went away with a packet that I had prepared for him for the trip (some food and some money) as well as a picture of the all-forgiving Christ. Before leaving he asked me where he should go to hitch a lift. I showed him a place (several metres away on the right) and closed the door. I looked outside the window next to the door and was surprised to see no one. Neither in front, nor on the right, or the left. I waited a bit watching the indicated area of hitchhiking, but there was NOBODY. What surprised me as an afterthought, was how trustful I had been to let a complete stranger come into my home and let him look after my baby. It was obvious that this event struck me. Soon after, as I was reading a book about angels, I read the following passage: “Don’t forget about being hospitable, as some people have unwittingly entertained the angels.” (Hebrews ch.13,v.2) This was the explanation for me. I couldn’t see any other. Recently, having told this story to someone, she told me that it could only be Maitreya. Soon afterwards, a friend of mine who had just discovered Share International told me she same thing. What should I think? Can you clarify this for me? Nevertheless, whoever this person was, I’m very pleased he came! A. The name of the World Teacher, Maitreya, is Buddhist in origin. Maitreya is the name of the fifth Buddha, the Coming Buddha, expected by millions of Buddhists all over the world. They have a great expectation of His coming and today build huge Buddha statues in honour of, and to welcome the Coming Buddha, as Maitreya Buddha. If you were to ask a Japanese Buddhist, do you expect the Fifth Buddha to come, the answer would be a definite yes, Maitreya Buddha is the Expected One. Just as if you ask a Christian whether they expect the return of the Christ, most Christians would answer that they do indeed look for the Second Coming. Why? Because He said He would return. Q. Do you happen to know what prevents various religions from being more actively involved in promoting the return of a Great Teacher? A. If you ask Christians whether they expect the return of the Christ, most Christians would answer that they do indeed look for the Second Coming. In the same way, Japanese Buddhists believe Maitreya Buddha will only come in thousands and thousands of years from now. Certainly not any time soon. Why? Why would Maitreya wait until some very distant future time – have everyone wait, while we make wars, conflicts of all kinds in the meantime? Why would He wait rather than come at the earliest possible moment? It always seems strange to me, that they know and can make these dogmatic assumptions that they know the time but not the real time! Just some vague distant future, which is not very satisfactory to most people. My information is much more satisfactory! Q. I heard someone said that Maitreya has two billion people; what is the significance of this? A. Maitreya has nearly 2 billion people ready to respond to him, and there will be more who will respond to his ideas and demand freedom, justice, right relationship, sharing of the world’s resources, demanding of their governments. Already many are making their demands known, usually on a political level. Governments have been brought to the ground due to the demands of the people. Fraudulent elections have been proved to have happened and because of the demands of the people changes are taking place. This ability of humanity to speak as one voice will grow and grow. The demands of humanity will be the key factor in the changing of the world. People who have never demonstrated before will feel impelled to do so. Whenever there is a major demonstration or march Maitreya takes part in it – in New York, London, Washington. Maitreya will potentize the energy of these marches, simplifying the demands into one big demand for justice, freedom and sharing for all. In this way the new world will be constructed by humanity itself. He will build, in this way, world public opinion. It is this force which will end the ambitions of the US government to colonize the earth. It is this which will end terrorism and injustice. It is this which will show humanity, by the example which they themselves are giving, that humanity is one and when it raises its voice as one voice it can achieve anything. It is the greatest force on earth. So get ready to march and demonstrate. Practise! Get to like it. The time is coming when you will do little else! An image of the Madonna has appeared on a wall of the Military Hospital in Cordoba, Argentina. The distinctive silhouette was first seen on 11 February 2018. “Actually it was a huge surprise, something very motivating,” said Commodore Peralta, director of the hospital. He called it “a manifestation of the Mother of God.” Hospital authorities have arranged access to the image for relatives of patients who wish to pray before it. “In a corridor in room 7 of the hospital, at dawn on 11 February, a lady had a family member in very serious condition and in the corridor she prayed…. Suddenly an image that became more and more clear began to form on the wall above the radiator. “It should be emphasized that the radiator has been off for months, because here we are in summer and the temperatures are very high. The image was not there before, this is the most shocking. To do a test, some people have tried to clean the image with alcohol but it is not erased in the least. Looking at her from the side it would seem to be in slight relief in some parts, like a certain glow. The features are those of Our Lady of Lourdes, with hands united in prayer…. Photograph taken of the Singener Berg mountain, Germany. A child noticed an ‘Angel’ above the mountain. Sent by U.G-K. in 2006. Benjamin Creme’s Master confirmed the ‘Angel’ is a cross (the even-armed Cross of Aquarius) manifested by Maitreya. In a March 2018 op-ed in the Washington Post, a former high-ranking US government official in the defense department called on the US military-intelligence community to investigate the UFO phenomenon. Christopher Mellon, who served as deputy assistant secretary of defense for intelligence in two US administrations, cited recently released videos of US military aircraft encounters with unidentified objects, as well as numerous similar incidents in recent years, in calling for an investigation largely on national security grounds. Mellon also released a declassified video of a previously undisclosed US Navy encounter with a UFO that occurred off the east coast of the US in 2015. “The videos, along with observations by pilots and radar operators, appear to provide evidence of the existence of aircraft far superior to anything possessed by the United States or its allies,” Mellon wrote. Despite the growing evidence, Mellon said that “military departments and agencies treat such incidents as isolated events rather than as part of a pattern requiring serious attention and investigation.” A colleague of Mellon’s, Luis Elizondo, who ran a Pentagon intelligence program that examined evidence of “anomalous” aircraft, resigned last fall to protest lack of government attention to the increasing amount of UFO data.